I queued for LFR as dps hoping to get a sub-40 minute wait. 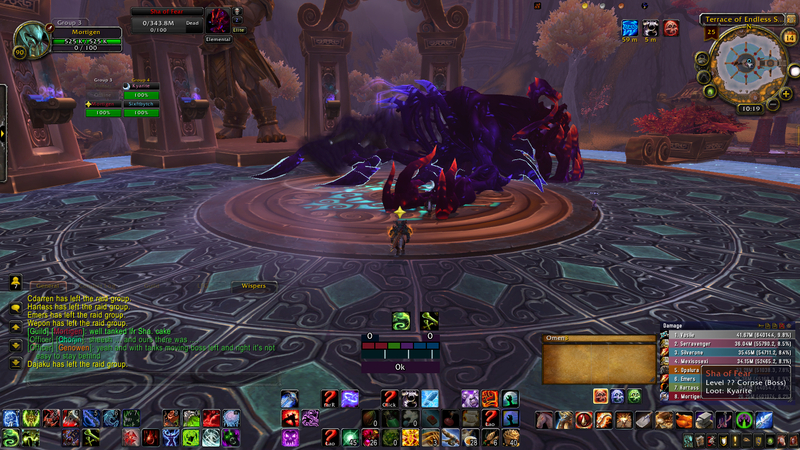 Wish granted – but the group was staring at the Sha of Fear, and we were one tank down. Damn it, I hate waiting. So I grabbed my Tank set, chatted to the current heavy, and we pulled. One Dead Sha. And I think my meter is broken in that fight, as it has my 8th on Dps – which cannot be true. I think I’ll do more tanking in LFR now. This entry was posted in Raid, Warcraft and tagged lfr, raid, sha of Fear, tank by Typhoonandrew. Bookmark the permalink. Meter isn’t accurate on Sha as it doesn’t track other people when you’re ported away from the group during the fight, and it doesn’t track those that are ported away while you remain, too.